HealthPark Valet simplifies bringing the caring and compassion back to patient movement—along with cost savings and efficiency—with our Internal Patient Transportation Services. 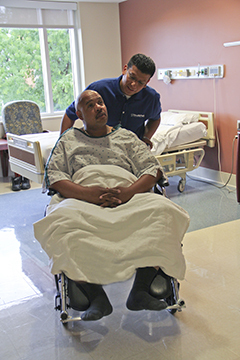 With HealthPark University training, our team excels not only in transportation basics, but also in patient-centered care. Your hospital can return to on-time schedules, happier employees focused on the jobs they were meant to be doing, lower labor costs, and more time to attend to more pressing matters—like clinical care. Contact us to learn more about our cost-efficient and compassionate transportation services and how they tie in to our other hospitality and parking solutions.